Are you looking for a new phone, and decided to detach yourself from the iPhone crowd, and yet want something else apart from Android without being tied down to something too business-like such as the BlackBerry range? I guess there really isn’t much choice left, which leaves us with Microsoft’s Windows Phone 7.5 operating system. One of AT&T’s latest offering would be the Samsung Focus S, making it one of the rare few devices from the South Korean manufacturer that does not have the cute little green robot running around in the background. Just what is the Samsung Focus S? I suppose it is something like the Sony Ericsson Arc S – where throwing in a ‘S’ suffix translates to a better smartphone overall, being an improved version of the original that was rolled out sometime last year. Tipping the scales at a rather light 3.9 oz, sporting a 0.33″ waistline. Apart from that, the display size stands at 4.3″, bringing Super AMOLED Plus display goodness to your eyes. The old PenTile display is also no more, since this is a full RGB display. While it is rather similar in terms of design to its dual-core Android cousin – the Samsung Galaxy S2, the Focus S will feature a single core processor from Qualcomm, with Windows Phone 7.5, Mango as the operating system of choice. There will be an 8-megapixel shooter at the back with an LED flash, while you get a dual-stage, dedicated camera button that surely does away with the guessing game of shooting high-quality shots at a moment’s notice. 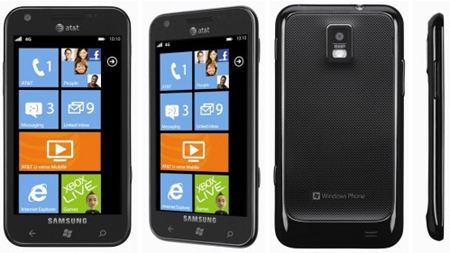 Those who are interested will have to fork out $199.99 for the Samsung Focus S from AT&T with a 2-year contract. Any takers? Between the Android platform and Microsoft’s mobile operating system, which do you think you would place your focus on – pardon the pun?